A New Jersey church priest pointed a musket at an 8-year-old child inside his church and threatened him with it over an apparent sports rivalry, prosecutors say. 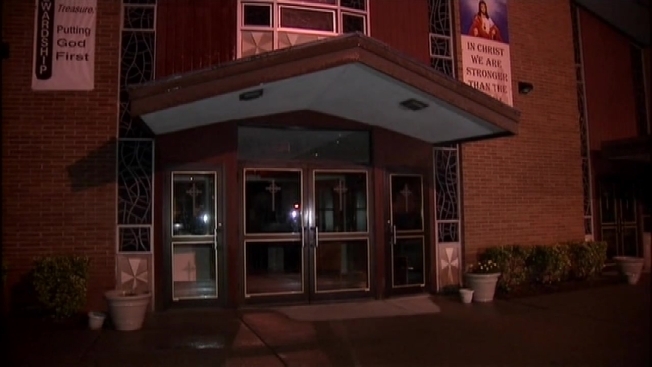 The 54-year-old priest at St. Margaret of Cortona Roman Catholic Church in Little Ferry was arrested Friday on charges of endangering the welfare of a child and aggravated assault by pointing a firearm, the Bergen County Prosecutor's Office said. The priest allegedly approached the boy before Mass services at the church on Sunday, Sept. 13, and asked to see him in one of the rectory rooms, according to prosecutors. Once they were in the room, the priest allegedly had the boy stand against the wall, then retrieved a musket and pointed it at him, prosecutors said, citing several witnesses. "As he raised his weapon and pointed it at the boy, he said, 'I'm going to shoot you,'" Bergen County Prosecutor John Molinelli told NBC 4 New York Friday. The boy was not hurt, Molinelli said. One of the parishioners who witnessed the incident contacted Newark Archdiocese officials on Sept. 25, and the Archdiocese in turn contacted the prosecutor's office on Sept. 28. The prosecutor's office began investigating along with Little Ferry police, and on Friday, interviewed the priest at the rectory. A search of the room turned up the weapon that was allegedly used -- a functioning Civil War-style musket -- as well as gunpowder, ammunition and other associated items for the gun, authorities said. Prosecutors said the priest, a Giants fan, was apparently unhappy because the boy planned to root for the Cowboys in a game against the Giants later that day. "The young boy was apparently a fan of a particular football team, the priest was not. So perhaps we have indication it started out as that," said Molinelli. "There's no such thing as joking around with a weapon when you're dealing with an 8-year-old kid," he added. The Giants lost to the Cowboys 26-27 on Sept. 13. The priest, Kevin Carter, was freed on $15,000 bail. His attorney, Harold Cassidy, said Carter will plead not guilty. Cassidy said Carter is expected to be arraigned Tuesday. The Archdiocese did not immediately respond to a request for comment. The prosecutor's office says Carter was ordained in Newark in November 1986 and has since worked at various Roman Catholic churches across the Archdiocese. He has been at St. Margaret of Cortona since February 2013.